Freshly renovated, Kereru Cottage is a delightfully quirky, cosy place to stay in the sunny Whangaparaoa peninsula, just 30 minutes from Auckland city. 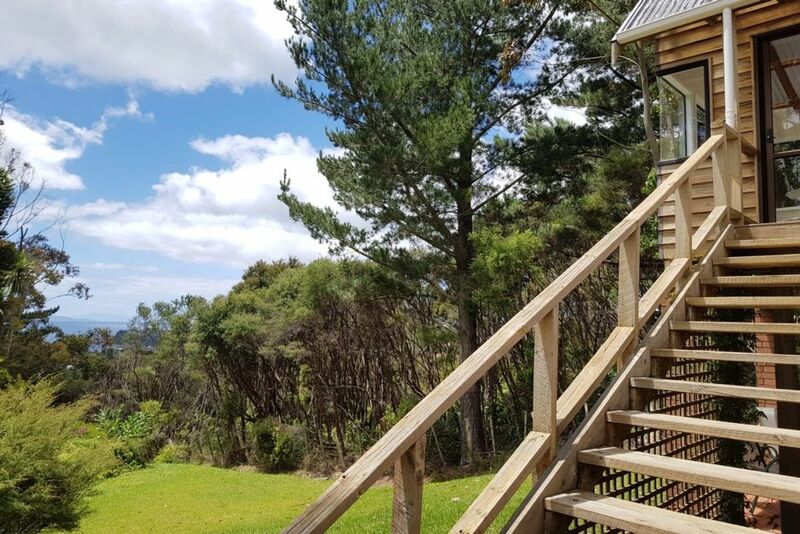 Situated high on a ridge looking northward out across Stanmore Bay, you will enjoy the peaceful, semi-rural setting surrounded by trees, with a view of the sea. Kereru Cottage is a standalone building with its own driveway and garden, offering your own private space. Suitable for families with young children, couples and small groups. Come up the outside stairs and you enter Kereru Cottage through the sunny conservatory, which provides a warm and sheltered space for summer dining. Inside, find the cosy lounge, master bedroom with double bed, second bedroom with another double bed, and semi-ensuite bathroom (accessible from either bedroom). The sofa in the lounge opens to provide a third bed if required. A heatpump/air conditioner keeps the cottage toasty warm in winter and cool in summer. The lounge has a new LED TV with access to Netflix and Prime Video included, plus Freeview HD. The kitchen is equipped with an oven, microwave, tea and coffee facilities, and a dishwasher. Some breakfast foods, milk and basic cooking supplies are included. Guests have full use of the cottage (except garage). There is a grass area for kids to play, and space to park several cars. Linen (bedding and towels) is included. For longer stays we can provide a laundry service (once per week). Your hosts Simon and Sophy live in the house next door. We'll happily help you with any questions during your stay, or respect your privacy if you prefer to keep to yourselves. Choice of beaches nearby. Pool and leisure facilities at Stanmore Bay. Shopping at Whangaparaoa Plaza. Restaurants and supermarket up the road. Native birds including tui and fantails frequent the bush around the property. If you're lucky, you might spot the namesake kereru (native woodpigeon)! Special conditions: This property is strictly NO SMOKING anywhere on the grounds (inside or outside). We thoroughly enjoyed our stay here. The cottage was very well kitted out, comfortable and the views were stunning. The shower was great, the kitchen had everything we need and our kids (5 & 3) loved the toy box, backyard and the birds. We’d return happily! Well equipped with off road parking, but the water supply, pressure and hot water in the kitchen sink was a problem, the shower was interesting as well. Nice clean unit, ok if you can climb outside stairs. Really sorry that you had trouble with the water pressure during your stay, Richard. The cottage is on a rain water supply that provides beautifully clean and pure water, and the pump usually provides a good pressure throughout. After reading your review I checked the system and found that the primary water filters (which remove sediment and other particles from the water before it reaches the taps) needed replacing much sooner than expected. After doing this the pressure is back to normal (the current guests have told us the shower is now "excellent"!). Thanks for choosing Kereru Cottage and apologies again that this issue impacted your stay. A great stay. Very clean and tidy and well provisioned and private. Water pressure quite low which made showering fun. Perfect hosts and location! Private and charming! We loved our stay here. The couple was very responsive, met us in check in, and had the place cleaned and prepped for us. Worked with us on early check in and let check out and were a joy to deal with. Location was awesome too. 5 min drive to beach and shops. We loved it. Thank you!!! We loved our short time at Kereru Cottage. It was quiet and peaceful, has beautiful views, a great location, and was a lovely place to come back to after a busy day exploring nearby areas. We would definitely recommend the cottage and would love to come back. We had a great stay! Close to Auckland, very private and a smart TV so perfect for a quick get-a away to relax. Lovely views too!